Until the discovery of Neanderthal admixture in all non-African populations by the Max Planck Institute for Evolutionary Anthropology, the most publicly popular narrative of human evolution and settlement around the globe was the Out of Africa model, which posited that all humans descended from a single population of humans originating in Africa approximately 200,000 years ago who proceeded to settle the globe in the subsequent years, completely replacing whatever archaic hominids may have been occupying the lands that they settled. The model received a further blow after the sequencing of DNA from a fossil finger bone found in Denisova revealed that Melanesian populations had further admixture with the population to which the individual whose finger was found belonged. One of the popular signifiers of Christianity has been the ΙΧΘΥΣ symbol, which has been standardized for use on the rear bumpers of devoutly Christian drivers everywhere, sometimes with the Greek written on the belly as can be seen below on the left. In response, some secularists produced the image on the right showing a fish with legs and DARWIN written on its body as can be seen below on the right. Since then there have been an explosion of competing bumper logos symbolizing the ideological combat of Darwinians and Christian Creationists made on both sides. While I like the concept, I think that the execution needs some improvement in two areas. The first is that in the inequality sign (≠), the slash runs in the opposite direction. The second is that, though Glaivester’s version seems to be a parody on the logo of the Human Rights Campaign, the formost LGBT* lobbying organization in the United States, it is quite a bit more elongated than the original logo. 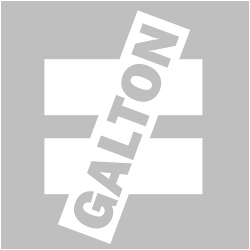 As such, using the original logo as a template (the blue background version, on the left), I’ve made my own version of the Galton Inequality, as shown on the left. I’ve also created a Logos page where I have some variations on the graphic for those who would prefer a different color combination. Feel free to use and distribute these logos as you see fit. If you have an hour of free time, I’d recommend watching it. As Reuben points out, the narrator of the documentary does not seem especially sanguine about Watson’s views, but in many ways this is meant to balance against Watson, who is given quite a bit of time to speak his mind without much direct criticism of his views. In light of the views presented in this PBS production, it’s easy to see why Watson’s statements to The Sunday Times caused such a furor, essentially ending Watson’s career. Watson’s philosophy is essentially a form of eugenics which is focused on the choices available to parents. He believes that parents should be able to make informed decisions regarding the genetics of their offspring. For instance, as a simple case, there is a current practice of screening fetus for Down Syndrome. Given a positive result, the parents would have the choice of aborting the fetus, which happens in the majority of positive screenings. Watson approves of this, as do I, against the views of the pro-life movement, which can be embodied in Sarah Palin and her son Trig. Other opponents include those who have already had a child with Down Syndrome and one such family was featured in the film. While I sympathize with this family and understand their love for their son in spite of the difficulties, I like Watson think that not only should they have had the option to terminate the pregnancy, but that they should have sought to end it if they had screened for Down Syndrome and the test had come up positive. A child with Down Syndrome can never achieve what a fully functional human can and in essence, when such a child does what would be considered ordinary for other children of his age, it is considered extraordinary. The father expresses this feeling in a positive light, but the end effect is a child that will never grow up to be an autonomous adult as well as a robbing of resources from the other children of the family, including the prevention of future children. While the families of children who suffer from this disorder love them deeply, the harsh truth is that they are mostly a burden that makes a family worse off, not to mention the difficulties that the child himself would face compared to a healthy child, one that would be made possible should a family decide to end a Down Syndrome pregnancy. The program moves toward more controversial and difficult to answer questions when it broaches mental illnesses, with the chosen example being bipolar disorder, which has a significantly heritable component. Kay Jamison is brought on as a counterweight to Watson’s views. To my mind, Watson’s answer of leaving it to the discretion of the parents is the best answer. Parents who are at risk for having children with bipolar disorder are likely to have had relatives with the same disorder and are probably in the best position to determine whether or not they are willing to let their children live with it. Rarely more so than right now, where I find myself at the centre of a storm of criticism. I can understand much of this reaction. For if I said what I was quoted as saying, then I can only admit that I am bewildered by it. To those who have drawn the inference from my words that Africa, as a continent, is somehow genetically inferior, I can only apologise unreservedly. That is not what I meant. More importantly from my point of view, there is no scientific basis for such a belief. Because it was not a repudiation of his earlier comments, it was not enough to soothe the mob and he was stripped of his post as chairman of the Cold Spring Harbor Laboratory as a result.